CBT's current forums board: The newly re-opened forum boards (25 January, 2011, following a hack of the site's security) are still re-forming, with a required re-registration of all accounts. Currently, membership is at over 3000 members, with almost 15000 topics and over 350000 posts. Master Unit List: As referred to as the MUL, this is a database of all BattleTech units of any kind ever mentioned in a (canonical) source. More information here. Catalyst Game Labs: The official site for CBT's licensed publisher, which details their various gaming lines. Its most advantageous use is for retailers who stock CBT products. Official Dutch CBT website: Aims at the small Dutch CBT community. CamoSpecs Online: The official site for unit paint schemes featuring hand painted miniatures displaying your favorite unit's battelfield colors. Open to submissions from the fans and regularly updated with new schemes most every week. Catalyst Demonstration Team: Whether looking for a game for fun or looking to help determine Battletech history, the Catalyst Demonstration Team is the official CBT players group. From small scale games to full blown officially sanctioned campaigns, the Demonstration Team is there to help you experience the CBT universe firsthand. With a listing of local team members and locations as well as a calender with upcomming events, this is the place to find your fellow players. Veteran players can also sign up to become members of this elite group and help spread the word of Classic Battletech. BattleTech Fanon Wiki : For all your fan-created content. ComStar Historical Archives : Another encyclopedic effort that has an interesting layout. As a resource, it is still a bit undeveloped, but articles with some substance can be found occasionally. Initial appearances suggest that it hasn't been updated for about two years. Inner Sphere Atlas: an encyclopedia of BattleTech planets, with coordinates sometimes from canon sources, sometimes extrapolated from printed (canon) maps. Does not appear to have been updated in years, but provides quoted material about the planets and the information is still relevant. MechForce.US: A fan-based BattleTech resource site. Has some great materials for the CBT board-game, and has recently started a "BattleTech Player Database" ware players can try to find and contact other CBT/MW-RPG players near them. Pryde Rock Industries: This site, operated by 'Medron Pryde,' is a large depository of accumulated data, including programs and fan-created material. He seeks out any aid for CBT use, often providing several different fan-created spreadsheets, rules and graphics. His editorials are often insightful. A good first start for someone first entering the CBT world, as well as the old MechWarriors. Solaris 7: A community of CBT fans with online TRO's, both custom and canon, with a vast array of resources such as mech editors, a planetary database, an image gallery and active forums that hold regular design contests. Design and post your own custom BattleMechs, Aerospace Fighters, Vehicles or even Warships and get feedback from fellow designers. A large group of veterans are on hand to help new players get acustom to the design process and to understand the CBT universe as a whole. Wayne's Books FASA Battletech Reference: Descriptions, content lists and pictures of the original Battletech and Mechwarrior games sets and books published by FASA Corporation in the 80s and 90s. 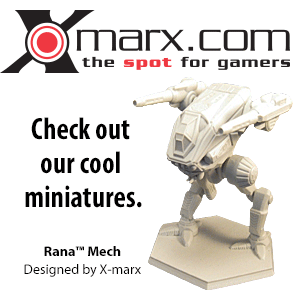 MekCity - Fan site for Battletech games Reference: Join our BattletechMUX server at mekcity.com:3067 Compete against other players and bots as well. BattleTech Engineer: A blog supporting various BattleTech computer applications, including the BattleTech Encyclopedia at http://goodsects.gotdns.com/bte which contains a full database of every single BattleTech unit, and will generate record sheets for each of them. Unit Color Compendium: A database and search engine for BattleTech unit color palettes and paint schemes. Battletech-Mercenaries - An online RPG based on the Battletech Universe. Methods of play include PBF and PbEM. If you always wanted to write your fan-fic of a ruthless mercenary trying to make out his living in a Merc Unit, this is the place for you. 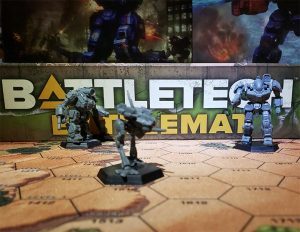 Battletech Universe - A CBT fansite discussing miniatures, fanfic, games, contests and more. Lords of the Battlefield - An online BattleTech community specializing in miniatures, 'Mech design and tactical superiority in gaming. Our BattleTech - An online community hosting several alternate universes and BattleTech fiction. BattleCorps: InMediaRes' store for Catalyst Game Labs' material, including Shadowrun and other game lines' products. Exodus Road: Run by BattleTech fan and BTW Editor Jherbert2, this online store has been up for years and sells products (primarily books and miniatures) from 15 different producers, including Catalyst Game Labs and Iron Wind Metals. HeavyMetal Software: The official software for Classic BattleTech. The site provides updates on available and forthcoming software, as well as a few downloads provided free by creator Rick Raisley. HeavyMetal forums board: In its second incarnation (as of September 2001), these forums are pretty active as far as CBT boards go, though generally centered around fans of the software. As of July 2009, the forums have almost 18,000 topics and 1,600 members. Take sides on the Periphery planet, Randis IV, and assist the Lyran Commonwealth or the Capellan Confederation in their struggle for dominance, by claiming bases, destroying generators and relays, and defeating all enemies who try to defend them. Head to the front lines in one of over 400 units including: Battlemechs, Tanks, Battlesuits and VTOL to lay waste to all that stand in your path. A text-based, real-time simulation of the popular Battletech board game by FASA, using frequently changed, top down graphical maps in a 'Heads-Up' combat display for classic tabletop style feel. This page was last edited on 28 December 2018, at 09:07.